Your first 100 days in a new leadership position are critical, as they set the foundation for your team's success going forward. 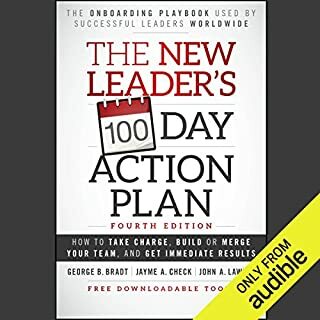 The New Leader's 100-Day Action Plan helps you start gaining traction even before your first day in a new job. The playbook gives you a concrete strategy for getting a fast start - engaging the culture, setting direction, aligning the team, avoiding common missteps, and delivering results. Getting a new job or a big promotion is like building a house: You need to get the foundation right for both. With a job, the quick-drying cement is how well you do in your first hundred days, since they establish the foundation for long-term momentum and great performance. The world’s most trusted guide for leaders in transition. 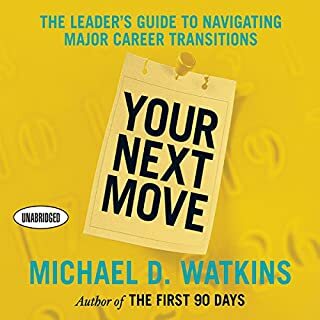 In this updated and expanded version of the international bestseller The First 90 Days, Michael D. Watkins offers proven strategies for conquering the challenges of transitions - no matter where you are in your career. Watkins, a noted expert on leadership transitions and adviser to senior leaders in all types of organizations, also addresses today’s increasingly demanding professional landscape, where managers face not only more frequent transitions but also steeper expectations once they step into their new jobs. By walking you through every aspect of the transition scenario, Watkins identifies the most common pitfalls new leaders encounter and provides the tools and strategies you need to avoid them. You’ll learn how to secure critical early wins, an important first step in establishing yourself in your new role. Each chapter also includes checklists, practical tools, and self-assessments to help you assimilate key lessons and apply them to your own situation. This is a very practical book, filled with tools that can be put to practice the moment you're done with it. The examples that it presents are very useful in tiying up all the theory it adresses. The audible version does not provide me access to the multitude of charts and tables that the author talks about. Those are the core of any action one can take after listening to this book. Amazon should atleast provide a PDF with those tables and charts. 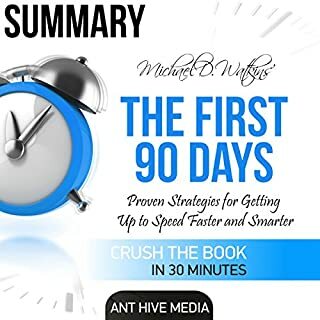 Would you consider the audio edition of The First 90 Days, Updated and Expanded to be better than the print version? The audio edition is excellent. I listened to it in the car though, and wanted to take notes while I listened. Lots of valuable information. I might listen again and jot down notes and look at the graphs more intently. 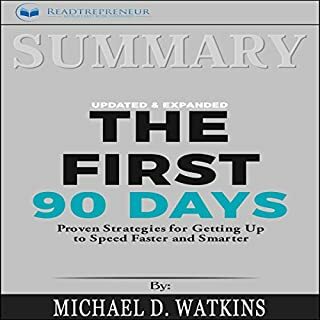 What other book might you compare The First 90 Days, Updated and Expanded to and why? The Power of Habit, Good to Create, Built to Last. All similar self-help / increase productivity at work / increase ability to transition books. Great audio book. Now comes with the PDF of charts and worksheets, you might have to visit the audible.com site and look at your book library. For me the PDF is in plain sight. Very useful. Contains a lot of great ideas, but makes many references to worksheets or visual information that is not available in audio format. 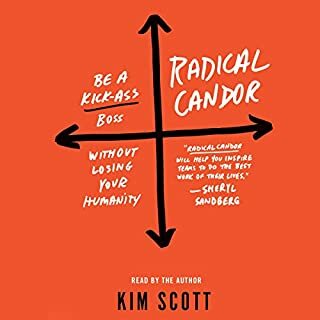 Where does The First 90 Days, Updated and Expanded rank among all the audiobooks you’ve listened to so far? Great book if you are looking to move up in your career following a new position. Beware though, that it makes many references to the charts, tables, graphs, lists, and figures contained within the actual book. Unfortunately, the audiobook does not come with these images which I felt were extremely important to the application of the book. It would be great if a pdf was provided which contained these items, but instead, I had to go out and buy the physical book as well. If you can find your way around this issue, it is well worth it. It does a good job of creating a visible plan for you to follow to ensure your success and upward mobility within a company. Don't wait until after you get the job to get this book though. I wish I would have read it before I even got the position to be able to go in with a legitimate plan and purpose. Instead I got it six weeks after I started which still helped tremendously. I found this read to be a hard read but the information worth putting up with the dry reading. It was very informative and helped me see where I could have improved in previous employment. I would recommend this book to a friend. They are referenced quite a bit, but aren't available. And, the audiobook costs more than the printed version. I would recommend it to anyone entering a new company Very structured guidebook helping to find the right approach in first months within an organisation. This is a reputable book with a storing following. however the audio book is terrible. There are references to diagrams in the book throughout. This leads to a disjointed audio experience. Filter it through yourself from a private and professional perspective. What factors apply or can be applied for your situation? So don't try to take it as a dogma, don't 'copy-paste' it. The author has a lot of experience with businesses, but lot of jobs are NOT sales / marketing related, so do a cherry picking: what applies to you? You can even treat it as a hand book, and revisit interesting chapters (use bookmarks!) from time to time. Tipp: I also bought the book, to read along. Maybe also consider doing the same. Worked for me. Book is great, but there were too many bugs, with the audio skipping parts of the book. Not a major issue (i think that the skipped sections were short), but disappointing. The all-time classic for aspiring leaders. Yes, initially I borrowed the book from a friend who works in the IT industry. Since then, I got hooked and have since introduced it to at least two people both of whom have bought their own copies. The book stands out from the rest. In relation to the audio book, the voice of the reader (Grover Garner) was pleasantly authoritative and felt like an uncle giving you unassailable logic and advice. the premise for the book and the principals are great. This book as a audiobook is really hard to decipher into one of operational use. I felt once it got started you were sitting in a business school lecture and it was really hard to turn into practice. When it finished I really felt let down because I only had managed to take a couple of workable actions into my new role, but knew I had probably been told more I just seemed to miss them. 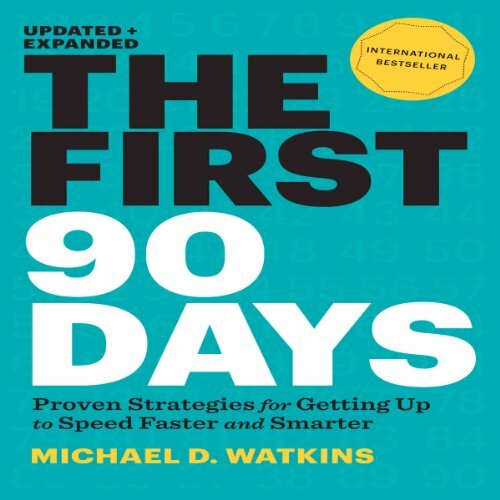 What did you like most about The First 90 Days, Updated and Expanded? 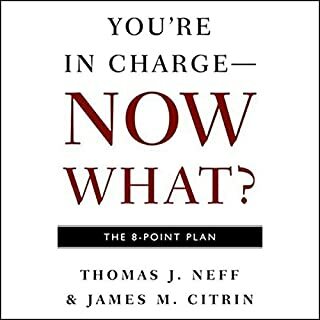 This is a great book for those moving into new companies or leadership positions and helps people focus on some of the often obvious, but sadly missed missed approaches to on-boarding. This book made me want to write a list and get stuck in! I downloaded the accompanying PDF (available on the Audible website) which sets out all the figures referred to in the audio book. Together they are an excellent resource, jammed with great information and ideas to help anyone stepping up in to a leaderships role. This is a great book but without the tables and charts it keeps referring to, it feels like walking in the dark. Valuable book if in print only ! However if it’s not a management position your are goingg for then you can use about 15% of the book I believe. Love it! A lot to absorb a lot to learn. I picked this up because I had an interview in which to present my 90 day leadership plan. It's comprehensive, packed full of content that you can't disagree with, and just isn't a book you read once. Aspiring and existing leaders must have. I also bought the book to enable me do the exercises and relate visually to what I was reading. I would say get the book instead, or end up forking out twice for audio and book like I did. While covering the 1st 90 days comprehensively in the 1st qtr of the book, the remainder covers supporting material that provided great depth in areas that I did not expect (e.g. office politics, career management, etc..,). I understand now why this book is rated in the top 100 all time best business books. Highly recommended. Wish I had this wisdom and toolset a long time ago - it would have helped tremendously.